Growing evidence suggests that neurodegenerative diseases like Parkinson's may develop in part due to environmental factors, including infections that can cause inflammation in the nervous system. New research from investigators from Jude Children's Research Hospital and Thomas Jefferson University has strengthened that connection. Mice who fully recovered from infection with the H1N1 influenza virus — the same virus responsible for the swine flu — were later more susceptible to chemical toxins known to trigger Parkinson's in the lab. "This study has provided more evidence to support the idea that environmental factors, including influenza, may be involved in Parkinson's disease," author Richard J. Smeyne, of Thomas Jefferson University and the Vickie and Jack Farber Institute for Neuroscience, said in a press release. The research study by Smeyne's team and first author Shankar Sadasivan, from St. Jude's Children's Research Hospital, was published online in the journal npj Parkinson's Disease. Parkinson's is usually a disease of older people. It usually hits around age 60 or so, though 10–20% of cases are diagnosed before 50. The disease causes neurons in an area of the brain called the substantia nigra to malfunction and die, decreasing their production of dopamine. The decline in dopamine results in loss of coordination and balance, as well as the tremors and rigidity found in patients with Parkinson's Disease. About a million people in the US live with this chronic and progressive movement disorder. The cause of Parkinson's is unknown, but a common theory is that it results from an interaction of environmental factors with an underlying susceptibility to these agents. Scientists believe inflammation in the central nervous system can increase the sensitivity to subsequent hits or insults with agents that otherwise would not induce significant neurological damage, and that second hit can trigger Parkinson's-like changes in the brain. It's called the "dual hit" or "multi-hit" theory and proving it was an objective of the new research study. To test if influenza virus could act as one of the insults in the "multi-hit" hypothesis, the researchers used an experimental model of Parkinson's in mice. 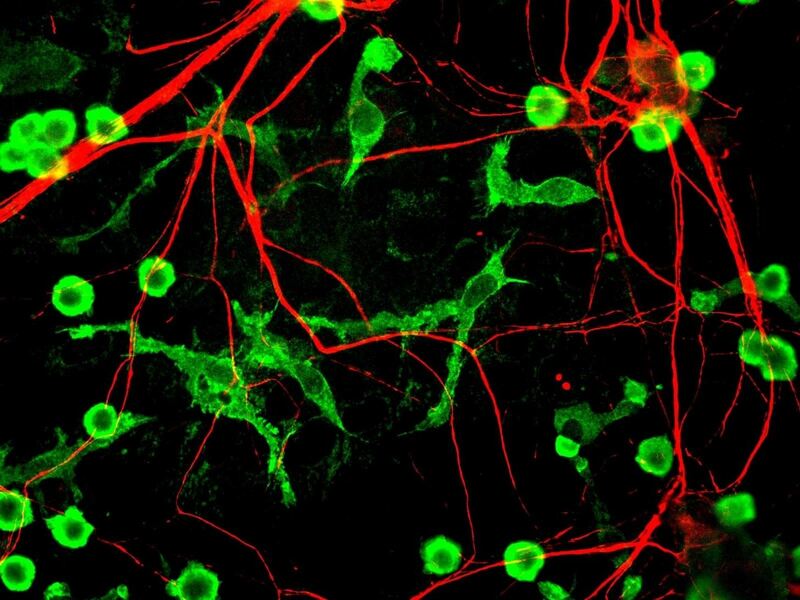 In mice, treatment with 1-methyl-4-phenyl-1,2,3,6-tetrahydropyridine can trigger Parkinson's-like symptoms, with a loss of dopamine producing neurons and an inflammatory response involving activation of microglia, immune cells of the nervous system. To test the dual-hit theory, the scientists infected some mice with H1N1 flu virus before they treated them with 1-methyl-4-phenyl-1,2,3,6-tetrahydropyridine to see if the two agents would cause greater microglial activation and loss of dopamine-producing neurons than either insult alone. Mice infected with H1N1, then administered the Parkinson's inducing chemical showed a synergistic loss of dopamine-producing neurons in the substantia nigra part of their brain — the effect was 20% greater than the combined loss by each agent on its own. The increased sensitivity to 1-methyl-4-phenyl-1,2,3,6-tetrahydropyridine was prevented by flu vaccination or by treatment with treatment with oseltamivir carboxylate (Tamiflu), an H1N1 virus inhibitor. Both the flu and the chemical caused inflammation in the brain, but treatment with both vaccination and antivirals did not produce a synergistic effect. "Here we demonstrate that even mice who fully recover from the H1N1 influenza virus responsible for the previous pandemic (also called 'swine flu') are later more susceptible to chemical toxins known to trigger Parkinson's in the lab," Smeyne said in the press release. The research team has found experimental evidence for the multi-hit theory of Parkinson's development in mice. Smeyne said elucidation of the mechanism of this effect and the optimal interval between the "hits" remain topics of future studies. In the meantime, if the flu can act as one of the events needed to initiate Parkinson's, the authors emphasized the importance of getting a flu vaccination to avoid an infection. If the multi-hit theory bears out in humans, it might eliminate one hit.